The awaited German attack came on the morning of the 21st March 1918. Codenamed Operation Michael, it was the first of a series launched over the next few months. Michael was a hammer blow that by its end had forced the Allies to retreat up to 40 miles. It caused massive dislocation and disruption within the British Army, resulted in the loss (killed, wounded or captured) of over 254,000 Allied soldiers and led to some of the darkest days of the war for the Allies. The Germans captured more ground in sixteen days than the Allies had in the entire war, however Michael also demonstrated some major flaws in the German methods, and the shock of the attack forced the Allies into deeper and more effective coordination. The Germans also failed to identify the main British vulnerability, and their own, irreplaceable losses reached 240,000. Michael and the later German attacks contained the seeds of their own failure and the effect they had on the Germans contributed to the success of the Allied offensive later in the year. The territory taken during Operation Michael. 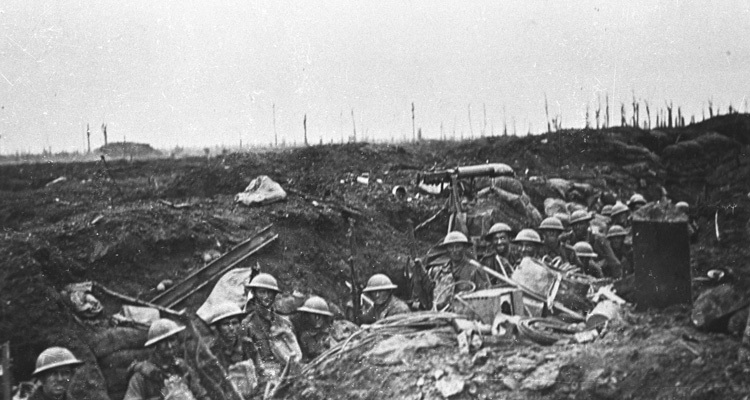 Michael was launched against the southernmost British formations on the Western Front: Third Army and Fifth Army. The French held the line south of them. The German plan was to attack at this point in order to split the two Allies, forcing the British to fall back to protect their supply lines to the north and the French to retreat south to protect Paris. After this they would turn north, forcing the British out of France and hopefully inducing the French to surrender before the Americans could arrive in large numbers. The Germans would use three Armies, Seventeenth in the north, Second in the centre and Eighteenth to the south, for a total of 45 divisions and 6608 artillery pieces. Third and Fifth Armies faced them with 33 divisions and just 2686 guns. 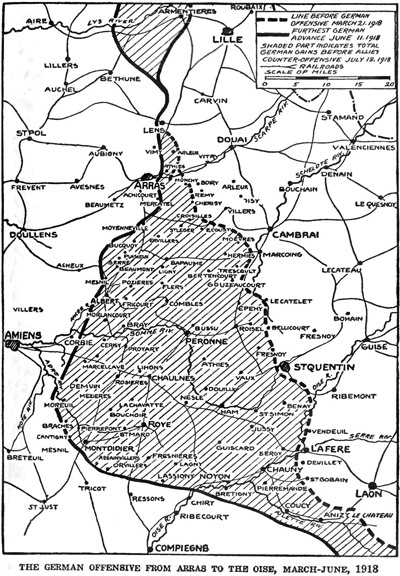 Due west of Fifth Army’s sector was the city of Amiens, which was an absolutely vital road and railway hub for the British logistic network. Almost all the supplies brought in from Britain and destined for units in the southern part of the British sector passed through Amiens. Losing it would be catastrophic. 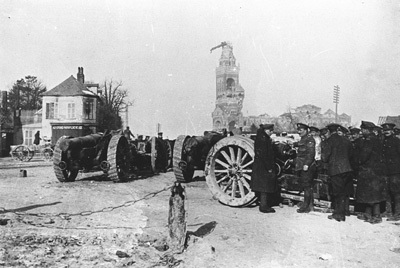 The German attack began at 4:40am on the 21st March with the heaviest artillery bombardment of the war so far. It lasted just five hours, but its ferocity disorientated the British defenders and disrupted communications. It was followed by a creeping bombardment that covered the German infantry advance. These first infantrymen were Stormtroopers. They had been specially selected, trained and equipped to attack using infiltration tactics. This involved moving in small, separated groups and bypassing the strongest British defences, instead focusing on cutting them off from support to the rear. Supported by artillery and concealed by mist, the Stormtroopers infiltrated around British positions in the Forward Zone. Many outposts were cut off and, overmanned as they were, this led to very heavy losses. By the end of the day over 38,000 British soldiers had been killed, wounded or were missing (with 21,000 of them captured), 500 guns had been lost and the British Forward Zone and parts of the Battle Zone had been overrun. However heavy British resistance, especially by Third Army, had slowed the German advance and brought both Seventeenth and Second Armies to a halt. Most success had come against the weaker and more dispersed Fifth Army, which encouraged Ludendorff to switch the focus of his attack to Eighteenth Army. On top of this, German casualties were as great as the British. The plan was already in trouble. The Leaning Virgin in Albert. After surviving 3 years in this position, it fell when the Germans captured the town in April. The next few days were the most dangerous, as the British continued to retreat, allowing the Germans to advance even further. British chains of command were disrupted, units got intermingled and their lines of retreat began to diverge, threatening to open up gaps that the Germans could work their way through. This was especially the case against the overstretched Fifth Army, where command and control almost broke down. However, the Allies could afford to lose ground here. Further to the north Third Army, who stood between the Germans and the vital Channel Ports, held on. Slowly the Allies recovered. On the 26th March the British and French armies were placed under a single commander for the first time. This was French General Ferdinand Foch. He used his authority to order French reinforcements to help the British. On the 28th March Ludendorff again switched focus, this time to the north, ordering Seventeenth Army to launch a short-lived attack on Arras named Operation Mars. Third Army’s defences here were stronger than Fifth Army’s had been on the 21st, and it wasn’t foggy. Mars failed within 2 days, and on the 4th April Ludendorff switched his main effort again, back to Eighteenth Army and Amiens. After failing to take the vital city, he ended Michael on the 5th April. A British 9.2” howitzer. 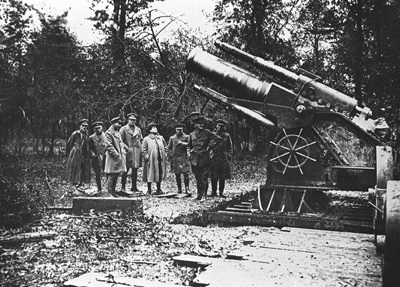 Heavy guns like this were in short supply with Fifth Army. For all the ground it captured and the shock it inflicted, Operation Michael was a failure, and whilst there’s no question that the stubborn Allied defence was the main reason for this, the German plan contained a number of errors that also contributed. These were mostly at what is known as the operational level of war, lying between the overall strategy and lower level tactics. Ludendorff’s decision to switch the main effort of the attack three times during the offensive caused disruption for supply units and reinforcements, as they had to change the direction they were moving each time, delaying their arrival at the front. The plan also had the three Armies moving apart as they advanced, rather than coming together and increasing their combat power. Perhaps most importantly, the Germans seem never to have realised the importance of Amiens, and focused on defeating the British Army in the field rather than taking the town and destroying their logistic infrastructure. There were tactical shortcomings too. Second Army had the least artillery support of the three, despite being the main effort. The famous Stormtroopers were well trained and effective, infiltrating around frontline British positions and creating disruption to their rear. However most German soldiers weren’t Stormtroopers. The tactics of many follow-on units were cruder, much easier for the British to defeat, and far more costly in German lives. On top of this, the Germans were short of cavalry. Cavalry can move faster than troops on foot, making them very effective at catching and destroying a fleeing enemy. Without them, the Germans couldn’t advance faster than the British could retreat, meaning they could defeat, but not destroy, their opponents.